Ghadames is an oasis town and one of the oldest pre-Saharan cities. The old part of the town, which is surrounded by a wall, has been declared World Heritage. Each of the seven clans that used to live in this part of the town had its own district, of which each had a public place where festivals could be held. In the distant corner where Libya, Algeria and Tunesia meet,is Ghadames, an ancient Sahara outpost that was already mentionned in the time of Roman emperor Septimius Severus, 200 after Christ.The jewel of the oasis is the walled old city where 7 clans used to live seperately, but with an identical set up.Around 40 families, the heads meeting regularely to discuss matters and make decisions, a kind of early stage parliament right in the desert.Renowed for its distinctive architecture, we visit the old mosque and the Koranic school, the old butchery, a tailorshop, and a bakery right besides the living quarters.Some of them have been renovated and beautifully decorated.Nice fruit and vegetable gardens as well.It is possible to wander around on the rooftops from one house to the other on narrow house walls, which feels sometimes like a circus acrobat.Women in the old times were forbidden to wander the streets alone, and they used the rooftops as a thoroughfare. Ghadames can be reached by private car, in a public bus or in shared taxis.Its s whole day trip. Wortwhile stops are Qasr al-Hadj, Nalut or Cabao with its wonderful food storage fortresses and would be canditates for Unesco if Libya will ever have a tentative list! We spent an unforgettable sunset time at the summit of the Ghost (Ras al Ghoul) and the huge sand dunes of Erg Oriental, very close to the Algerian border. 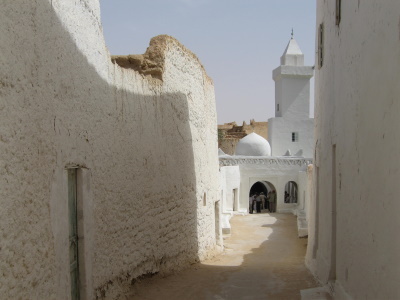 Damaged in World War II: "Until World War 2, Ghadames was the home of Libya's oldest mosque, the Atik...built in 666, but destroyed by Allied bombing. A new mosque has been erected in its place." Built in the 12th century: The settlement at Ghadames goes back at least 5000 years.The first historical information is from 19 BCE when the Romans named it Cydamus. It owed its later significance to its location on one of the major routes of trans-Saharan trade from the Niger area which grew in size based on use of the camel from c300ad and the Islamisation of both Ghadames and on into W Africa during the 7th/8th centuries. This trade continued through to the 19th century. The town's original mosque is said to have been dated from 666AD. The architecture and layout of Ghadames will have developed organically over that period. The Libyan People's Bureau places the age of the current town at 800 years. Role of Women: The upper floors used to be reserved to women only. They were often interconnected between adjacent buildings so that men could avoid women.